The Weekend Gourmet: Introducing Totally Bamboo's New United States of Bamboo Cutting Board Line! Introducing Totally Bamboo's New United States of Bamboo Cutting Board Line! One of the most important tools that any serious cook needs to have in their kitchen is a good-quality cutting board. A necessity in the preparation of almost any meal, this lowly rectangular slab of plastic or wood went about its job with little fanfare or style for years. Until now, that is. Totally Bamboo has changed all that, elevating a mundane kitchen utensil into something fun and functional. They recently Introduced their “United States of Bamboo,” featuring 50 different cutting boards representing each state. “We designed these cutting boards to be both fun and practical,” said Tom Sullivan, co-owner of Totally Bamboo. “On the practical side it is a very functional cutting board that will serve the kitchen well. On the fun side, well that’s pretty obvious." In keeping with Totally Bamboo’s mission to use only sustainable natural materials, each of these state-inspired cutting boards is made from 100% renewable bamboo. Totally Bamboo introduced the first bamboo cutting boards more 12 years ago. Bamboo is a lightweight, tough and sustainable product that is an excellent alternative to the world’s dwindling supply of hardwoods from which traditional cutting boards are made. Each of their cutting boards is full of natural rich wood colors brought out by the natural caramelization of the sugars found in bamboo. Totally Bamboo recently sent me a fun Texas-shaped cutting board from the line, and I am absolutely loving it! Not only does it work great as a cutting board for chopping veggies…it’s also perfect for entertaining. I recently used mine as a serving board for cheese and crackers at a party, and my guests went nuts for it. 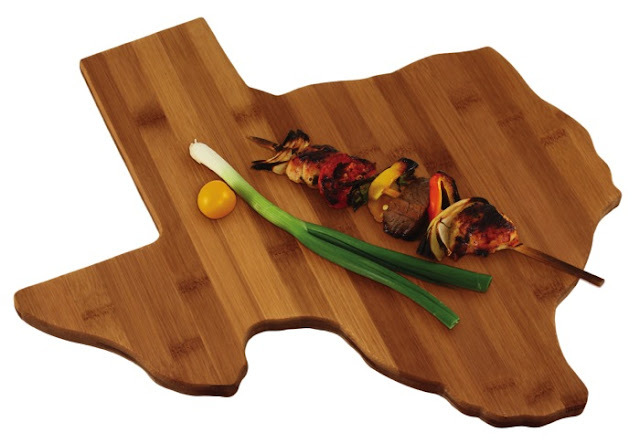 Let’s face it, us Texans love our state…and this cutting board lets me display my Texas Pride! These bamboo cutting boards also make great gifts for family and friends who love to display their state pride. Whether you’re from big Texas or tiny Rhode Island, these cutting boards are scaled to the same generous size. The States line of bamboo cutting boards has an MSRP of $19.99. For more information, visit Totally Bamboo’s website. Disclosure: Totally Bamboo sent me a Texas bamboo cutting board to try out in my kitchen. The opinions expressed are my own.